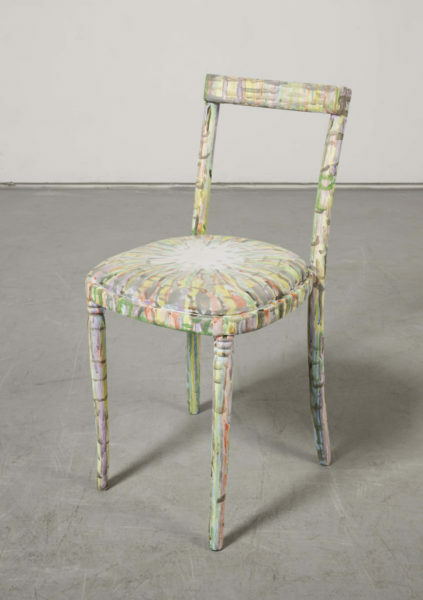 Hayley Tompkins, Chair, 2013, Acrylic paint, chair, 82 x 39 x 44 cm. Courtesy the artist and The Modern Art Institute/ Toby Webster Ltd, Glasgow. Hayley Tompkins, Untitled, 2015, Acrylic paint on found object; acrylic paint on cotton, 51 x 18 x 10 cm; 59 x 19 x 1.5 cm. Courtesy the artist and The Modern Art Institute/ Toby Webster Ltd, Glasgow. Hayley Tompkins (b.1971) was born in Bedfordshire and is based in Glasgow. Her work has featured in British Art Show 8 (touring 2015–17) and other past projects include solo exhibitions at Drawing Room, Hamburg (2015), Aspen Art Museum (2013) and Inverleith House, Edinburgh (2009). Painting plays a pivotal role in Tompkins’ work. 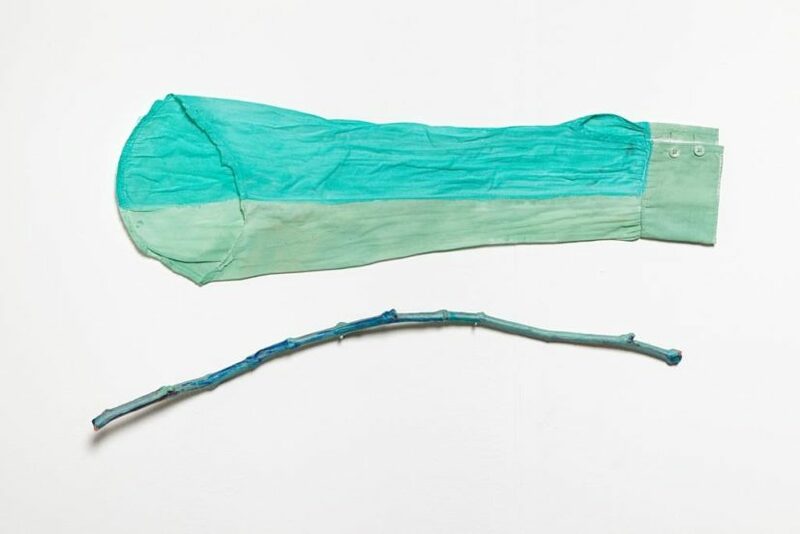 While she has made colourful abstract works using the traditional medium of watercolour on paper, she has also applied her distinctive palette of muted greens, ochre tones and bright sherbets to a wide array of everyday, found objects such as hammers, bottles, knives, chairs, twigs, mobile phones and fragments of clothing. All of these materials are carefully worked on by Tompkins to amplify their particular qualities and suggest new possibilities and identities. Untitled (2015) and Chair (2013) are strong examples of Tompkins’ practice and they will enable Touchstones Rochdale to draw meaningful links with other sculptural artworks that explore the use of found materials, colour and form. This includes work by Claire Barclay, Rosa Nguyen and Natasha Daintry, which was recently acquired for the collection through the Contemporary Art Society. In a broad sense the work continues to build upon the gallery’s history of collecting women artists and adds to this strength within the collection. Tompkins’ specific use of a chair and a shirt sleeve in Chair (2013) and Untitled (2015) also connects to the large collection of furniture and textiles held by the museum. As such, the acquisition supports Touchstone Rochdale’s ongoing programme of using contemporary art to newly contextualise and reinvigorate elements of their social history collection, reflecting Tompkins personal interest in creating the possibility of new meaning through her practice.